Regular spatial patterns abound in natural systems. Understanding how patterns arise in ecosystems provides insights into how these ecosystems function. Spatial patterns occur in different ecosystems at various scales. In semi-arid ecosystems patterns in vegetation reflect the amount of water stress and how the ecosystem might respond to future changes. Another striking pattern in the African savanna is the regular arrangement of termite mounds across the landscape. The pattern arises from competition and conflict and results in optimal packing of termite mounds across the landscape. Mathematical modeling suggests that the spatial arrangement of the mounds makes the entire ecosystem more likely to withstand and recover from periods of drought. “Now that I have seven acres of countryside to steward, I’m feeling somewhat overwhelmed about where to begin. I’ve done my PDC and designed my property, but now I have all these pieces that I somehow need to fit together and I need to prioritise my tasks. The problem is that permaculture is a set of principles, not a framework. While it is certainly a process, it lacks a set of linear steps to follow. Clearly, what permaculture lacks is a clear decision-making process. Taking a PDC doesn’t solve the issue, while it helps with the design phase and developing a site plan, what is frequently ignored is “how to install the design”. This helps me develop my design incrementally, envisage the ‘big picture’ and, most importantly, I have an order in which to establish my farm. 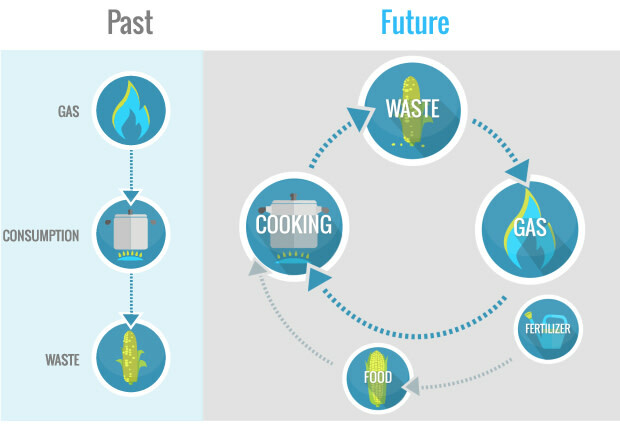 “Turning waste into gas and fertilizer, creating an in-house cycle of energy. HomeBiogas is a family-sized affordable biogas system. It converts any organic waste into clean cooking gas and a high-quality liquid fertilizer for the garden. Your kitchen leftovers can turn into 3 hours of cooking per day. You’ll be cooking dinner with the gas produced from lunch’s leftovers. Pretty amazing, right? “There’s a book… a book that is 576 pages long. It was first published in 1988. Some of you may have read it, some of you maybe haven’t. “This book is about designing sustainable human settlements, and preserving and extending natural systems. It covers aspects of designing and maintaining a cultivated ecology in any climate: the principles of design; design methods; understanding patterns in nature; climatic factor; water; soils; earthworks; techniques and strategies in the difference climatic types; aquaculture; and the social, legal, and economic design of human settlement. It calls into question not only the current methods of agriculture, but also the very need for a formal food agriculture if wastelands and the excessive lawn culture within towns and cities are devoted to food production and small livestock suited to local needs. The world can no longer sustain the damage caused by modern agriculture, monocultural forestry, and thoughtless settlement design, and in the near future we will see the end of wasted energy, or the end of civilization as we know it, due to human-caused pollution and climate changes. Strategies for the necessary changes in social investment policy, politics itself, and towards regional or village self-reliance are now desperately needed, and examples of these strategies are given. It is hoped that this manual will open the global debate that must never end, and so give a guide to the form of a future in which our children have at least a chance of reasonable existence.” Bill Mollison: Permaculture, A Designers’ Manual. This book is Permaculture, A Designers’ Manual. “Douglas Barnes of permaculturereflections, who is a sustainable designer from the countryside in Tweed Ontario, has created a great tool that can be used to help with Swale implementation. This calculator, located on his website here, addresses Swale spacing that has been a perennial question in Permaculture. This calculator turns the problem on its head and gives you the best estimate for spacing based on swale size.